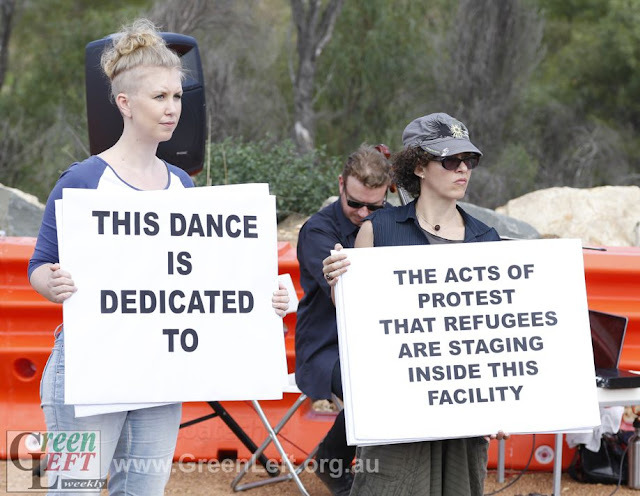 This live blog recorded some of the activities that took place as part of the national convergence for refugee rights at Yongah Hill Detention Centre, April 26-28. 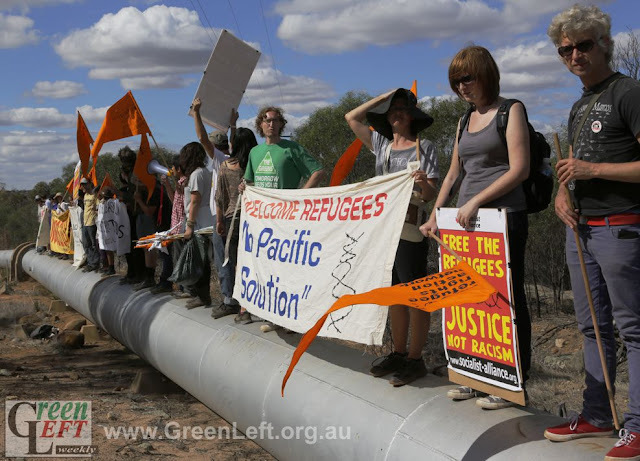 Photos taken of refugee rights activists on the Kalgoorlie pipeline. Impressive and awe-inspiring dance journalism ended with police taking one dancer and two spectators into custody (mid performance). All three have been released and it seems at least one will face charges. All three have move-on notices and have to leave the campsite. Photos and video from "dance journalism"
Gathering waiting to see what the spectacle of "dance journalism" will entail. RRAN has raised a "freedom" banner into the air with helium balloons. Convergence gathering for discussion of national plans for refugee rights movement including plans for World Refugee Day and campaign against deportations. Mainstream media reports about the convergence: Perth Now and The West Australian online (from Friday). 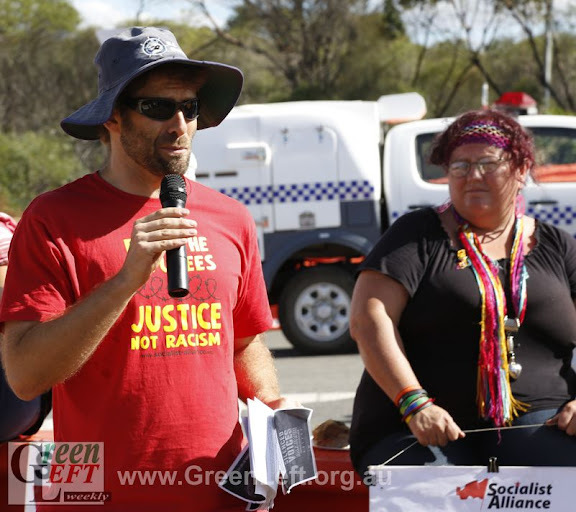 About 100 people took part in the rally today, that tried to verbally connect with refugees held inside the detention centre, while police kept us hundreds of metres from visual contact. "Life is built on hope and you cannot live without hope. And today you give those people a bit more hope. "And thank you for being a strong voice for those refugees. This is illegal. "Keeping children, families, pregnant women in here is illegal. Having this beautiful heaven, when some people are locked up in there is illegal. "Making you people sad is illegal. "Attacking a neighbouring country, putting blood on the street of Afghanistan and Pakistan in the name of democracy, human rights, women’s rights is illegal. "Keeping people in detention because they asked for life, they asked for freedom is illegal. "Thanks for all of you, and I hope to see more support from you, and thanks." Heading back to the main campsite for more workshops. 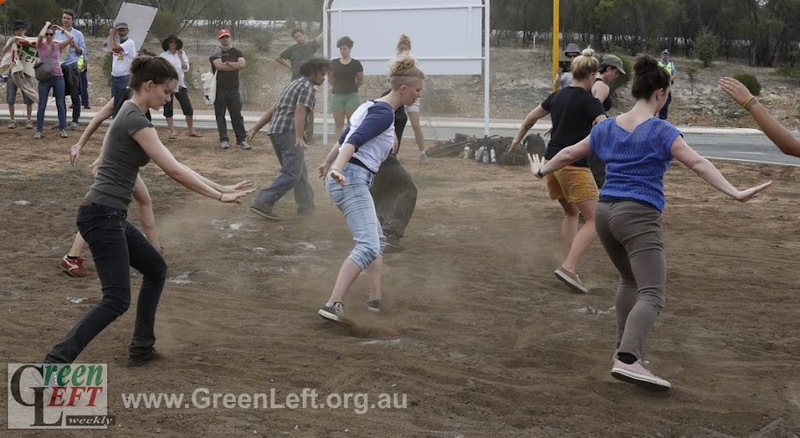 Marcus Hampson responds to the suggestion that refugees inside are playing soccer, not really communicating with protesters: "It looks like they're playing soccer, you be the judge of what's happened." He said, based on past experience, it would not be surprising if refugees chanting had been shepherded back into their rooms. Also he said that soccer games and similar activities are often organised by Detention Centre staff at the time of, and in response to, protests outside. Chants of "no more racism, no more fear, refugees are welcome here", then a march up the hill to look into the detention centre. 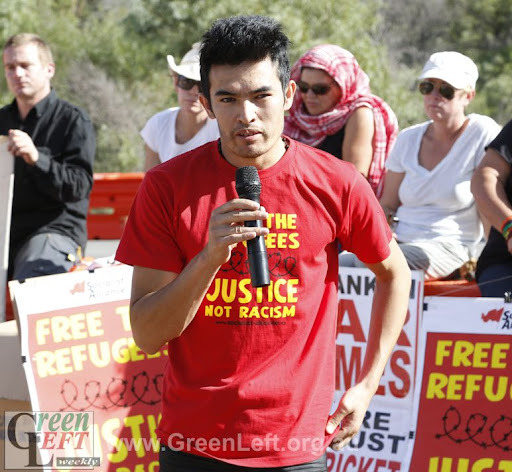 Mohammad says: when I was ten years old, I was in Manus Island detention centre. They told me I would never get to Australia. Now I am here. That is because of people like you, who protest. The refugees who were chanting to us appreciate the link. You are their pathway to survival. After hearing refugees chanting to protesters, Liz Walsh from Melbourne Refugee Action Collective says: we are here to break down barriers. There is no such thing as a nice detention centre she says. 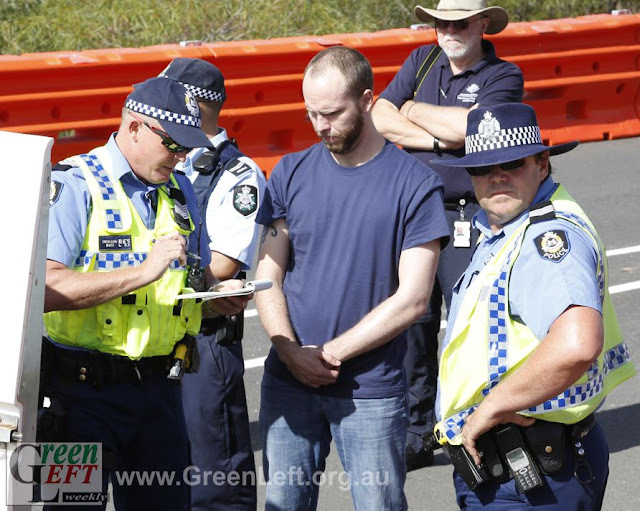 In Melbourne, 30 people are on hunger strike for thought crimes, that is, for having ideological sympathy with a national liberation movement. Daniella Olea from Melbourne RAC: seven tents and 20 people stayed over night on the first night in support of 27 hunger strikers. Followed by chants of "Free, free, free Ranjini". Rama: More Tamils would be here today but there is a well organised strategy of intimidation of the families in Sri Lanka of Tamils who speak out. Rama: Australian government last week voted at the UN that genocide is taking place. But then they've returned Tamils last week without even testing their asylum claims. 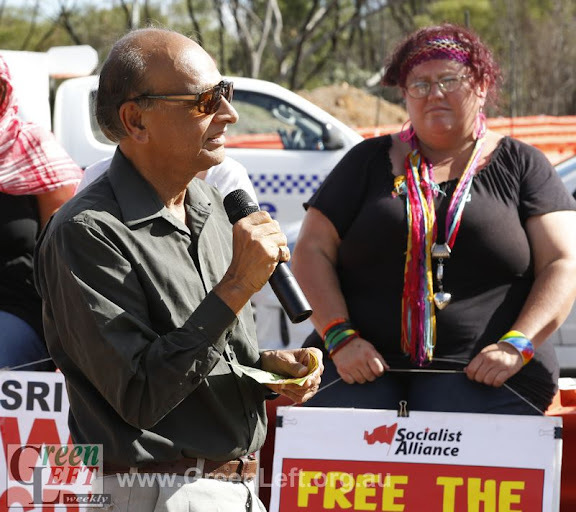 Rama from the Tamil community and Sam Wainwright speaking about justice for Tamils. Wainwright: shame on Julie bishop for suggesting at the end of last year that Tamil refugees should be sent home without even having their claims for asylum tested. The bigger shame, though, he said is that this policy is bring carried out in practice under labor. Jammo Jameson speaks next giving greetings from the Maritime Union of Australia. MUA flags are in the rally. The union movement needs to support more campaigns like this he said. 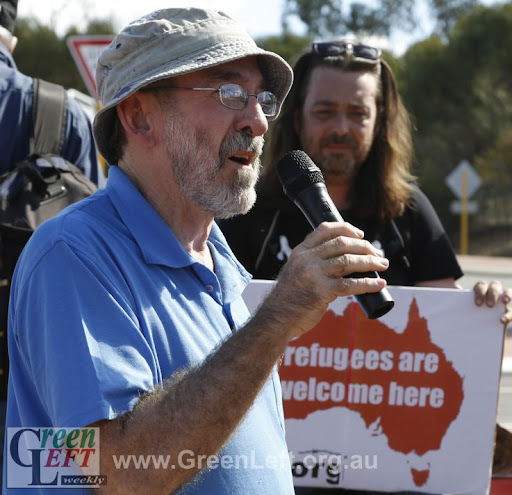 Ian Rintoul from the Refugee Action Collective in NSW is the first speaker. He says refugees with adverse security findings from ASIO should be released into the community (instead of facing indefinite detention). 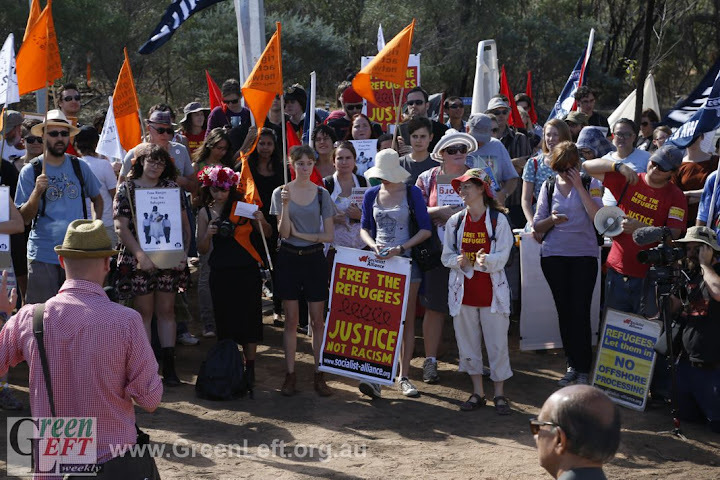 Instead of criminalising refugees, Yongah Hill Detention Centre is the real crime and it should be closed down. Rintoul: Tony Abbott knows the boats are not going to stop. As long as the Australian government continues to shake hands with [Sri Lankan president Mahinda] Rajapaksa, supports war in Afghanistan, and supports other authoritarian regimes, there will be refugees who need our support and we should give them welcome. Rintoul: Human rights does not depend on the election timetable. Our campaign will continue until all the fences come down. Rally begins. Marcus Hampson says day one of the convergence was a success. Refugees could see our vigil. He congratulates whoever it was who corrected Abbott's billboard. Bus from Perth arrives, number of protestors swell to about 100. People line the road outside Yongah Hill and start noisy chanting. Former detainees lead the chant "Freedom! Azadi!" Advance guard of protestors arrives at the gates waiting for the bus from Perth. Chanting "no-one is illegal. Free the refugees". Greeted by dozens of police, multiple police vehicles and horses. The police dogs we saw yesterday are no doubt hiding to be brought out if needed. All this to respond to activists who are here to win human rights. Nicola Paris begins workshop on non violent direct action. Another bus departing East Perth transit centre with another 35 people. Sydney Uni Anti-Racism Collective is presenting a workshop on "why 'stopping the boats' won't save lives"
The camp is alive and well. Breakfast has been had. Workshops will be starting shortly in advance of the big rally at 1pm. 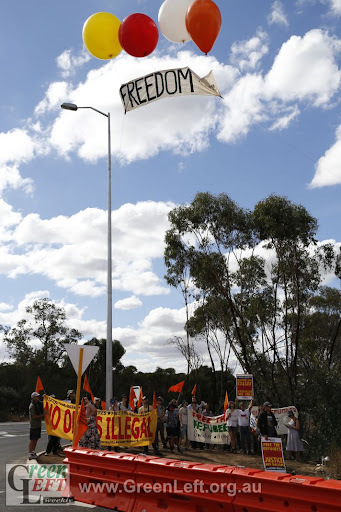 ABC news has reported on the convergence quoting Sarah Ross saying "it's this huge prison that's been built to imprison people who have committed no crime, so why are they being treated like criminals by being put in this high security prison". Former detainee Hadi Hosseini says when you're a refugee "it is a crime to ask for a life". Up to 130 people attended the candle light vigil in the end. Sarah Ross is on the phone to a refugee inside: "they can see our lights". Immediate response from the vigil: "free the refugees, free the refugees". Jaffah Batoor from the Hazara Association is explaining the situation for Hazara people. Hazaras face discrimination in Afghanistan, Pakistan and Iran. Official beginning of the candlelight vigil is an acknowlegement of country: "always was, always will be Aboriginal land". 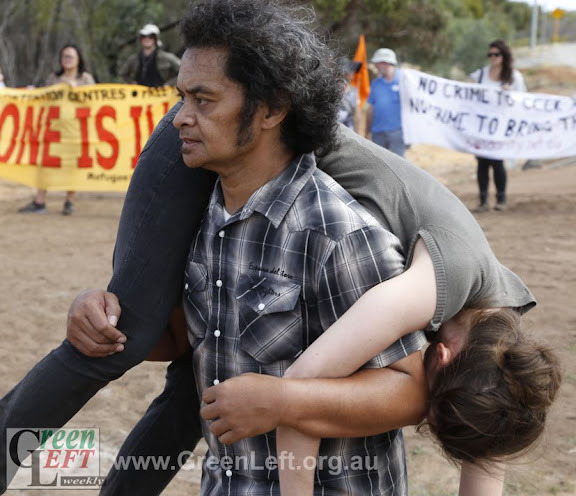 Lawrence Murray from Amnesty International is directing people to the lights of Northam, the nearby town. Northam has a population of 6000 he said. This is approximately the same number as the number of refugees in detention. Many thousands more on bridging visas deprived of rights including the right to work. 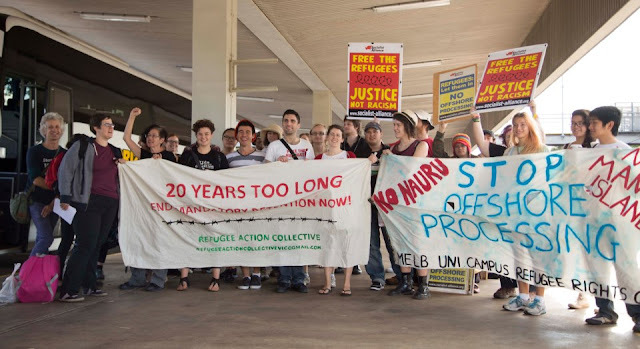 Murray: "We'd like to see an end to detention of refugees". Indefinite detention makes this worse. Criminals in jail know the date they are due to be eligible for parole, he said. Refugees face ongoing uncertainty, not knowing when they'll have a chance of release. This is a proven cause of mental illness and needs to stop, he said. Sarah Ross from RRAN is explaining the petty frustrations that have been imposed by Serco (Detention Centre administrators) on the people who visit every week. Guards largely make up the rules depending on how they feel. Yongah Hill Detention Centre looks particularly imposing at night. Lights fully ablaze make it look exactly like a prison - not fit for human beings. Over 80 people have gathered for the candle light vigil (which will begin a bit late as several carloads from Perth have been delayed). Balloons alight with LEDs and multi-coloured candles make a brilliant sight. Peter Wilkie from Refugee Right Action Network (RRAN) is explaining the prison-like environment including a "sterile" zone between the two external fences. Campsite set up ready for convergence. Arrived at detention centre gates. Big police presence with imposing barricades protecting the carpark from people who have arrived by bus. Over 35 people on the bus to Northam. Others traveling separately. 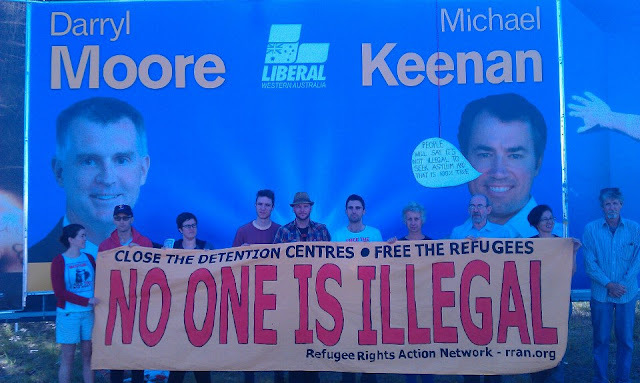 If you can't read the speech bubble it's actually a direct quote from Liberal politician Michael Keenan last week "People will say it's not illegal to seek asylum and that is 100% true". Some activists are planning to hold an action outside a Liberal party billboard in West Perth at 8:30am as a send-off for the convergence. The billboard is in the same location as the notorious billboard unveiled by Tony Abbott earlier in the week that falsely referred to "illegal boats". Falsehoods in that billboard were corrected when activists improved it resulting in a range of media coverage and an argument in The Age against the use of the word "illegal" when referring to refugees.